I love Doritos. Especially Nacho Cheese Doritos. They are so crisp when you open a bag, so flavorful, so vibrant. I freely admit that many a bag has not lived to see the morning- opened and then gone. Words fail me when I try to describe Doritos, the cheese, the spice, the corn! At times like this I think that the seminary should have trained me in poetry. There is a dark side to my Dorito love affair. The aftermath. That heap in my gullet composed of masticated corn and artificial cheese. If I may be so bold, it is the cancer of food. You start with one but then they quickly multiply and you are left with a useless mass of false food in your stomach. These weeks before Christmas, which we call Advent, can be much the same way. We are hungry, the semester has worn on and we are ready for something real, something satisfying, something that is greater than the world we live in. The world around us suggests Kay Jewelers, Norelco razors, and DLP flat screens. But we’ve tried these before in various forms- childhood toys, latest video games, and many others- and if we are honest, we’ve been left wanting. These coming days of Advent, while we shop, bake, eat, study, and test, remember there is only one answer to the question we all carry inside: Jesus Christ. Reawaken your need for the Hope of the Nations, reawaken your need for Jesus Christ. I think my greatest fear in life is to become lactose intolerant. Except for occasional brushes with arachnids, the loss of milk, ice cream, yogurt, and palatable delectable melt-in-your-mouth cheese would be life shaking. With that in mind, it takes an awful lot for me to dislike a cheese product. Such as Cheez-It crackers. I love the original. Baked cheesy goodness, a bit greasy, a bit stomach turning (after half of a box while watching Notre Dame football), but capturing the essence of baked cheese. So when I saw Cheez-It Crisps on sale, I thought “Hey, this looks like it would be a Cheez-It, only crispier, lighter, more “Better Cheddar”…y, but cheaper!” Boy was I disappointed and crushed. So consider this a warning to all you cheese lovers. I love to cook. Why? 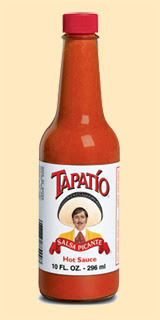 One week later, not only do they have Tapatio, but the never before seen 10oz size!